Maps are a fundamental resource in a diverse array of applications ranging from everyday activities, such as route planning through the legal demarcation of space to scientific studies, such as those seeking to understand biodiversity and inform the design of nature reserves for species conservation. For a map to have value, it should provide an accurate and timely representation of the phenomenon depicted and this can be a challenge in a dynamic world. Fortunately, mapping activities have benefitted greatly from recent advances in geoinformation technologies. Satellite remote sensing, for example, now offers unparalleled data acquisition and authoritative mapping agencies have developed systems for the routine production of maps in accordance with strict standards. Until recently, much mapping activity was in the exclusive realm of authoritative agencies but technological development has also allowed the rise of the amateur mapping community. The proliferation of inexpensive and highly mobile and location aware devices together with Web 2.0 technology have fostered the emergence of the citizen as a source of data. Mapping presently benefits from vast amounts of spatial data as well as people able to provide observations of geographic phenomena, which can inform map production, revision and evaluation. The great potential of these developments is, however, often limited by concerns. The latter span issues from the nature of the citizens through the way data are collected and shared to the quality and trustworthiness of the data. 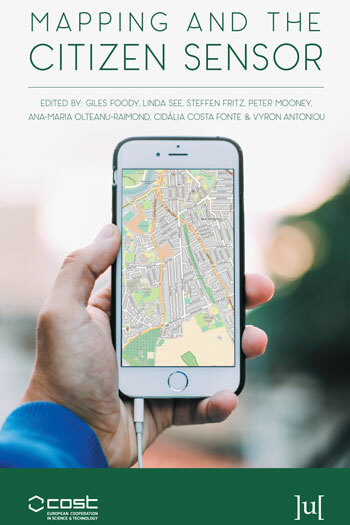 This book reports on some of the key issues connected with the use of citizen sensors in mapping. It arises from a European Co-operation in Science and Technology (COST) Action, which explored issues linked to topics ranging from citizen motivation, data acquisition, data quality and the use of citizen derived data in the production of maps that rival, and sometimes surpass, maps arising from authoritative agencies. 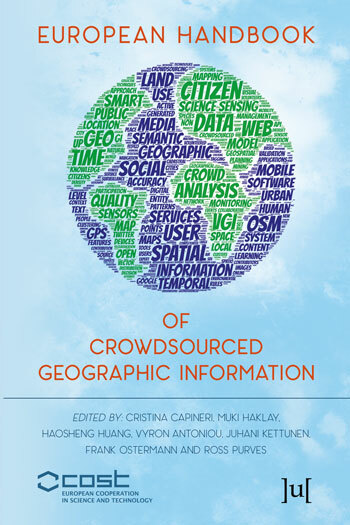 This book focuses on the study of the remarkable new source of geographic information that has become available in the form of user-generated content accessible over the Internet through mobile and Web applications. The exploitation, integration and application of these sources, termed volunteered geographic information (VGI) or crowdsourced geographic information (CGI), offer scientists an unprecedented opportunity to conduct research on a variety of topics at multiple scales and for diversified objectives. The Handbook is organized in five parts, addressing the fundamental questions: What motivates citizens to provide such information in the public domain, and what factors govern/predict its validity?What methods might be used to validate such information? Can VGI be framed within the larger domain of sensor networks, in which inert and static sensors are replaced or combined by intelligent and mobile humans equipped with sensing devices? What limitations are imposed on VGI by differential access to broadband Internet, mobile phones, and other communication technologies, and by concerns over privacy? How do VGI and crowdsourcing enable innovation applications to benefit human society? Chapters examine how crowdsourcing techniques and methods, and the VGI phenomenon, have motivated a multidisciplinary research community to identify both fields of applications and quality criteria depending on the use of VGI. Besides harvesting tools and storage of these data, research has paid remarkable attention to these information resources, in an age when information and participation is one of the most important drivers of development. The collection opens questions and points to new research directions in addition to the findings that each of the authors demonstrates. Despite rapid progress in VGI research, this Handbook also shows that there are technical, social, political and methodological challenges that require further studies and research. The MATSim (Multi-Agent Transport Simulation) software project was started around 2006 with the goal of generating traffic and congestion patterns by following individual synthetic travelers through their daily or weekly activity programme. It has since then evolved from a collection of stand-alone C++ programs to an integrated Java-based framework which is publicly hosted, open-source available, automatically regression tested. It is currently used by about 40 groups throughout the world. This book takes stock of the current status. 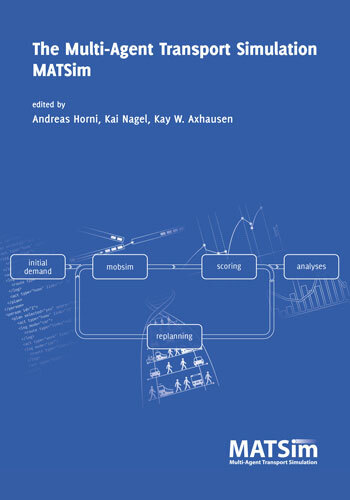 The first part of the book gives an introduction to the most important concepts, with the intention of enabling a potential user to set up and run basic simulations.The second part of the book describes how the basic functionality can be extended, for example by adding schedule-based public transit, electric or autonomous cars, paratransit, or within-day replanning. For each extension, the text provides pointers to the additional documentation and to the code base. It is also discussed how people with appropriate Java programming skills can write their own extensions, and plug them into the MATSim core. The project has started from the basic idea that traffic is a consequence of human behavior, and thus humans and their behavior should be the starting point of all modelling, and with the intuition that when simulations with 100 million particles are possible in computational physics, then behavior-oriented simulations with 10 million travelers should be possible in travel behavior research. The initial implementations thus combined concepts from computational physics and complex adaptive systems with concepts from travel behavior research. The third part of the book looks at theoretical concepts that are able to describe important aspects of the simulation system; for example, under certain conditions the code becomes a Monte Carlo engine sampling from a discrete choice model. Another important aspect is the interpretation of the MATSim score as utility in the microeconomic sense, opening up a connection to benefit cost analysis. Finally, the book collects use cases as they have been undertaken with MATSim. All current users of MATSim were invited to submit their work, and many followed with sometimes crisp and short and sometimes longer contributions, always with pointers to additional references. We hope that the book will become an invitation to explore, to build and to extend agent-based modeling of travel behavior from the stable and well tested core of MATSim documented here.